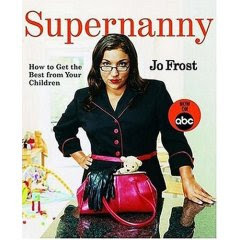 My sister Jeralee gave me the Supernanny book for my birthday. We've had some issues with Chandler not obeying what we say, testing his limits, hitting other kids, going to bed...etc. I was thrilled to get this and try some of her techniques. We recently moved in with my parents for about 6 weeks. Our lease was up at our apt complex, rent was going up, and we didn't want to sign a new lease, so we are kicking it with my parents for now, lol. Marshall and I decided since we were in a new environment that it would be a good idea to start implementing some discipline and get into a routine. Routine has always been hard for me as I love to stay up really late and sleep in in the morning, but I figure it is worth it if it helps Chandler to be better behaved. Supernanny suggests finding some area away from distractions when they are being disciplined, alas, we have the naughty spot. My sister uses a piece of carpet, we use this lovely black X. I noticed my friend Sara had an X with tape for time out for her little boy and I thought it was a great idea so we decided to go for that. If Chandler is doing something that is unacceptable he gets one warning and if he continues to do it, goes to the naughty spot. He stays there for 2 minutes since he is 2. I put him there and walk away so he can't see me, but so that I can hear or see him if he tries to get out. The first time we tried it, he came running after me 4 or 5 times. I don't look him in the eye or say anything to him, just simply put him back in the spot and walk away. After 2 minutes is up, I get down on his level and explain to him why he is in the naughty spot. The first couple days were really tough but it seems to be working wonderfully right now as long as I am consistent. He tends to throw himself on the floor and kick and scream for about the first 30 seconds but he's understanding there are consequences to his actions. He's also eating better at mealtimes since we've stopped giving him so many snacks, and he knows he CANNOT go out of the kitchen to eat or drink anything. There is another technique we are using at bedtime to get him to go down by himself since he is dependent on us laying down with him at night. There have been 3 nights so far that we haven't had to lay down with him, even though one of us (usually Marshall) has been in the room with him. Thanks Jer for giving me this book, it is AWESOME. I would recommend this book to anyone who has kids. Oh the naughty spot. When you told me about it on Sunday, I didn't imagine a duct taped x marks the spot! Way to go! Any news on jobs yet? No...Marshall had a couple interviews on Tuesday and it seems like everything he applies for they are looking for someone that has 3-5 years of experience. How the heck is he supposed to get experience if no one will give him a job? I guess he might hear back from one of the companies in Salt Lake but I'm not going to get my hopes up too much. I was feeling picky about where I wanted to go and now I'm not starting to care so much, as long as he gets a job! Good luck and keep it up. You will all appreciate when it really starts kicking in. Good job for working at it Tiff. You will be SOOO grateful for time out & a routine in the long run. Just remember what I told you "who is boss??" Good luck on the job hunting. I will still keep my eyes and ears open. Guess who is putting a giant X on her carpet tonight??? I don't know why I haven't done this before- you are THE BEST! (Can you tell we are having some discipline problems around here??) Good luck with yours! Woohoo! I am glad that it is working for you and you are following her tips. Consistency is the key! We have used the naughty spot for two years now. Charlise spends less and less time on her little carpet sample a.k.a. naughty spot lately. I love Supernanny! I like watching the show because it makes me feel better about myself to see all the messed up parents out there. Logan is quite a bit like Dean so we're lucky with that. We use our laundry room as his time out spot. Sometimes Ethan turns the light off which I think is SO mean. Super Nanny Rocks! Davy even asks to watch her show, he'll say, "Oh, those kids are being naughty!" Davy's had a naughty chair since he was about 18 months old, I only have to use it once or twice a week now. Stick with it! the tape is a good idea. Milas got me the book for having a baby. (a push present is what we call it) I have really enjoyed the book as well.